We’ve started offering our home again, via the Warm Showers website, to cyclists passing through town. I know, it sounds a little illicit, but it’s really quite innocent. Most people offer up a place to stay in trade for when they themselves go out on a bike tour. But I’m not touring much any more beyond an occasional bike ride around Eureka or the McKay Tract or the Arcata Forest. Our reward is meeting interesting people and hearing their stories. Some people are just on a lark, riding along the coast because they have the time, the youth and the resources. Some are on a personal quest or attempting to burn out some trauma. Then others are riding for a cause. 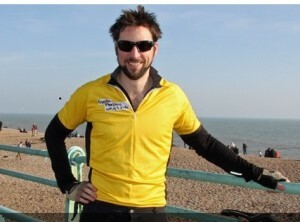 This week we had a bit of all that, but the most recent was a rider with a cause. Will King is raising money to help fund research into leukemia and cystic fibrosis. Motivated by the loss of two friends, Will, who lives in London, is riding from Canada to Mexico and looking for sponsors and donations. Visit his site, read his story and donate if you can.